To mark the celebrations of its 80th anniversary, Pininfarina has unveiled the Nido EV, the first running prototype of the "Nido Development Programme", the project for an electric car conceived, designed and built entirely in-house. To mark the celebrations of its 80th anniversary, Pininfarina has unveiled the Nido EV, the first running prototype of the "Nido Development Programme", the project for an electric car conceived, designed and built entirely by the Pininfarina Style and Engineering Centre at Cambiano (Turin). The Nido EV bears witness to the skills and experience that Pininfarina has built up in the development of electric vehicles, paying particular attention to the Segment A city cars that will populate the streets of the future to make our towns more pleasant to live in. 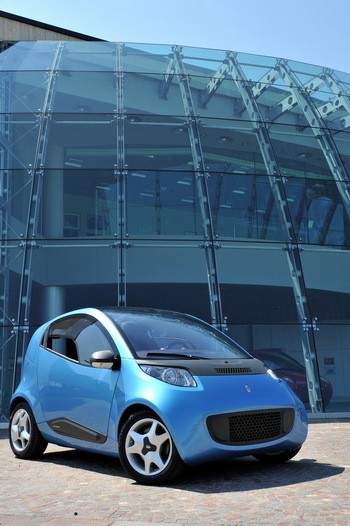 The exterior design of the Nido EV takes up and updates the lines and volumes that won the Nido of 2004 the award for the Most Beautiful Car in the World in the Prototypes and concept cars category, the Compasso d’Oro 2008 and a place in the temple of modern art, the MoMA of New York. On the other hand, the interiors of this first Nido EV project are still those of a technical prototype, with no attempt at stylistic research. 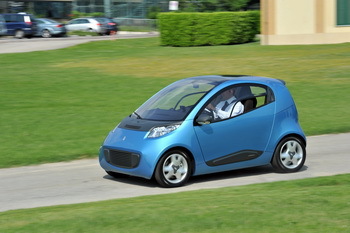 The Nido EV, a small city car (marginally larger than a Smart), has 2 seats and a permanent magneto rear engine. The “Nido Development Programme” also envisages the development of two more, slightly larger versions: the first will be a hybrid with an endothermic engine positioned at the front and an electrical engine at the rear; the second will be electric with a front engine. In both cases, the position of the engine makes it possible to increase roominess to seat 4, and to improve weight distribution. The Nido EV prototype is powered by a Zebra Z5 Ni-NaCl battery, which guarantees very high levels of safety and reliability. When fully charged, it has a range of 140 km and a top speed of 120 km/h (limited electronically), and accelerates 0-60 km/h in 6.7 seconds. The environmental compatibility of the Zebra Z5 battery is enhanced by the total absence of harmful or polluting chemical substances and the fact that it is 100% recyclable at the end of its life, in fact the batteries are recycled in the foundry and used to produce stainless steel. The prototype is also equipped with “green” tyres, developed by Pirelli paying particular attention to safety, environmental sustainability and saving. Where climate control is concerned, the “Nido Development Programme” will use an AC electrical compressor and a high voltage electric heater making it possible to implement automatic control strategies which will help to reduce consumption in most conditions. The Programme will also cover research into solutions and light-weight components with a high mechanical/electrical efficiency, and energy saving solutions (batteries with outstanding charging performance) and braking systems specifically for hybrid/electrical applications. Pininfarina aims to become the benchmark in Italy, and further afield, for sustainable mobility, just as it has been a global benchmark for style for the last 80 years, always investing in research and development programmes to tackle problems as they emerge in the motor industry rapidly and methodically. During the energy crisis of the 1970s, for example, the industry concentrated on aerodynamics and alternative sources of energy to reduce petrol consumption. Pininfarina replied by developing the CNR Energetica 1 prototype, with ideal aerodynamic bodywork. Those years also produced the Ecos, the first electric car developed by Pininfarina, underlining that it was on the cutting edge in an area that the motor industry had only begun to reassess recently. In the 1980s, Pininfarina research into the application of light materials resulted in the Audi Quartz and Lancia Hit prototypes, which explored the use of new and lighter metallic and compound materials. The 1990s brought greater understanding of environmental problems, more research in the field of recyclable materials and ergonomics, and a more efficient concept of how to “package” the vehicle. Pininfarina offered new solutions with the Ethos macro-project, a family of 3 cars with an aluminium chassis, recyclable resin bodywork and an innovative combustion engine with reduced emissions, building up to the Ethos 3EV in 1995, another zero emissions car. More recently, Pininfarina has focused its research on hybrid vehicles, with the Eta Beta and Metrocubo projects, two small cars with modular cabins that also tackle the problems of driving in town and on medium hauls. Then, in 2004, Pininfarina returned to the issue of safety, which it had touched on with the Sigma, Alfa Romeo P33 and Sigma Grand Prix prototypes, and in 2008 it proposed the Sintesi, a futuristic concept car powered by 4 fuel cells (one per wheel). 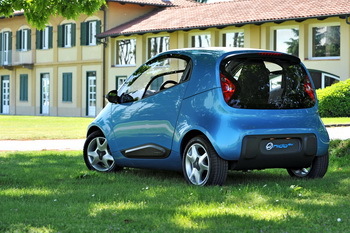 Today, with the new global crisis and the need to curb emissions and consumption, the opportunities offered by zero emissions urban mobility have grown significantly: the world is increasingly aware of the environment, and Pininfarina was the first industrial company in Italy, and one of the first in Europe, to propose a project for a 100% electric car, the BlueCar, developed jointly with the Bolloré company. Today, when all the large carmakers view the electric car as an opportunity, Pininfarina takes another step forward, promoting a new philosophy that incorporates the choice of individual and collective electric transport in the context of a new lifestyle that everyone should adopt in order to increase energy saving, and protect the planet. This is why sustainable mobility has become one of the pillars underpinning the Group’s activities. And it is also why the new Nido EV project is now being launched, in parallel with the BlueCar.